In 2014, IESI has completed construction of over 12.5MW of solar power at a variety of challenging project sites including a municipal landfill and a former ski slope. Through June 2014, IESI has constructed over 22MW of solar arrays and plans to install an additional 15MW in 2014. Two separate photovoltaic solar energy generation systems (8.4 Megawatts combined) were installed on land owned by the Cistercian Nuns of Mount Saint Mary's Abbey in Franklin, MA. The 4.8MW DC system has been interconnected to a 23kV distribution feeder and the 3.5MW DC system has been interconnected via a 13.8 kV feeder. 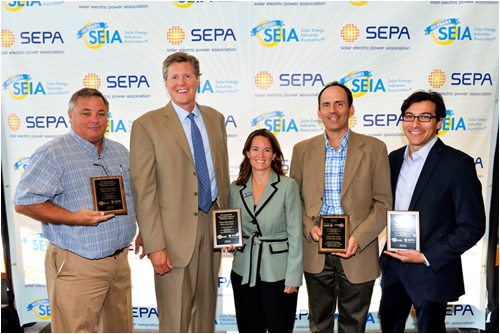 The highly successful projects were recently recognized by the PV America 2104 Photovoltaic Project Distinction Award. & CEO, SEPA. To the right are Andrew Bernstein and Everett Tatelbaum of Kearsage Energy. 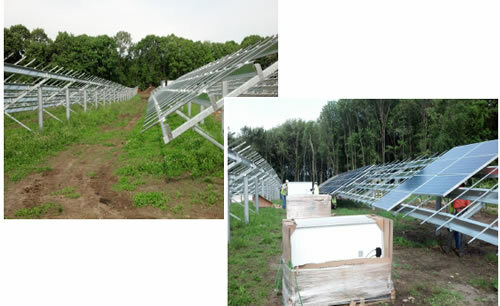 Innovative Engineering Solutions, Inc. Franklin, MA – IESI is installing two separate photovoltaic solar energy generation systems on land owned by the Cistercian Nuns of Mount Saint Mary’s Abbey. The 4.8MW DC system will be interconnected to a 23 kV distribution feeder and the 3.6 MW DC system will be interconnected via a 13.8 kV feeder. Challenges to these systems include wetlands, soils types, bedrock, topography and shading. These systems are expected to be active by the fall of 2013. The Town of Franklin will be the offtaker of the power generated by both systems and will realize and annual savings of $270,000+/- over the duration of the 20 year PPA. 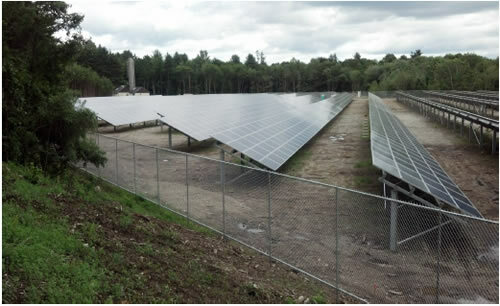 INNOVATIVE ENGINEERING SOLUTIONS, INC. Grafton, MA – IESI has installed a 1.7 MW DC photovoltaic solar energy generation system on land owned by the Town of Grafton. This challenging project was competitively bid as part of a PPA with the Town of Grafton and was constructed partially within the Zone 1 of a Public Water Supply Well and fully within the habitat of a Massachusetts listed Endangered Species. In addition to these complications, IESI had to incorporate two types of solar modules to allow the investor-owner to maximize their 1603 Grant while minimizing voltage losses at the uniquely shaped array. The project was delivered on-time and on budget and will result in the Town of Grafton saving $3,500,000 +/- in electricity costs over the 20 year PPA.